The return of high school football throughout Utah Friday night put me back in the same position in which I find myself each year at this time. With all of the talented teams and great matchups out there each week, it is difficult for me to choose which game to cover. 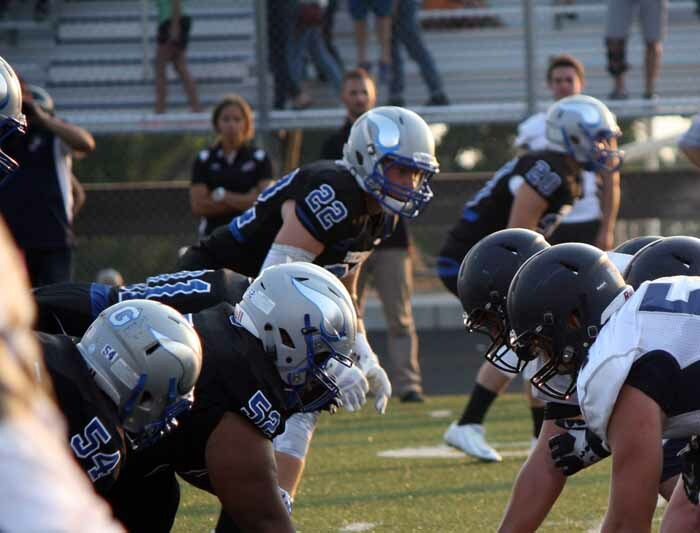 This week, I was drawn to the battle between a pair of teams who are getting a lot of attention from preseason prognosticators – Class 4A relative newcomer Corner Canyon at highly-regarded Pleasant Grove, expected to be back among the 5A elite. There are five things that most come to mind as I look back at what happened last night in Pleasant Grove, where the Vikings picked up a season-opening 28-19 win. 1) Malik Overstreet is one of the state’s most exciting players. Pleasant Grove’s Malik Overstreet put on an amazing show Friday night, as a receiver, a defensive back and most especially, as a punt returner. 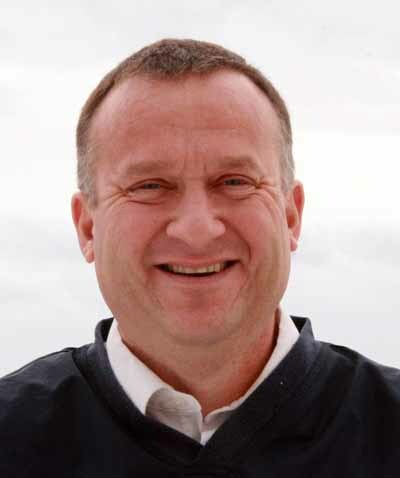 I am the first to admit that I am not with Scout.com or Rivals.com, nor am I anywhere close to an expert on who is being recruited by whom or what those recruiters focus on when they watch players. All I know is I like what I like. I don’t know how many schools are “offering” Overstreet, but I know those who aren’t looking at this 5-foot-10, 165-pound senior are missing out. He spent most of the night Friday running free and easy behind the Corner Canyon secondary, and if the Vikings had been more consistent with the long ball (see No. 4 below), he may have had four or five scoring catches. As it was, he caught one nine-yard touchdown pass from quarterback Isaac Hamilton just before halftime and then hauled in a 66-yard scoring toss from Hamilton late in the third quarter when he beat coverage on a post route and outran the defense to the end zone. That was all good, but the most impressive, and exciting run of them all was the one that iced the game with 7:23 left in the contest. After catching a punt at his 16-yard line, Overstreet weaved his way through the coverage, using an impressive ability to slow down before accelerating to blow past would-be tacklers. He finished the play by simply pulling away from his pursuers for the touchdown. Speed. vision, instincts, elusiveness….Malik Overstreet has game. Maybe it’s just me, but isn’t a special teams touchdown the most exhilarating play in football. I just love the explosiveness of a kick returner taking the ball to the house. It changes the tone of a game. Friday night in Pleasant Grove, we got a taste of special teams efficiency and the thrill of special teams quick strikes. The first – that came from sophomore kicker Conner Ebeling of Corner Canyon. He connected on field goals of 46 and 38 yards for the Chargers and it certainly looks like the kicking game will be a constant at Corner Canyon. Overstreet provided drama every time he touched the ball in the punt return game, including that electrifying touchdown run. Freshman Dane Christiansen also had moments returning kickoffs for Pleasant Grove, which seems to have weapons everywhere in the return game. The Chargers have a little talent in this part of their game as well. They answered the Vikings’ first touchdown of the contest with a Nate Cutler 98-yard kick-off return touchdown. Cutler got out to a fast start, found a crease, hit it hard and was gone. How does a team that throws four interceptions against a quality opponent still win the game? Pleasant Grove provided an answer to that question Friday night – it’s with an outstanding defense. You can’t make too many assumptions from one game, but it does appear the Vikings have the kind of defense that can carry a team even if its offense is struggling. It began with a pair of athletic senior linebackers, 6-1, 220-pound Tate Briggs and 5-10, 225-pound John Raass. Those two took up residence in the Charger offensive backfield (Briggs sacked the quarterback three times) and made life difficult for Corner Canyon all night long. One of the most critical defensive stands came after the Chargers scored a touchdown on the first play of the fourth quarter. It pulled them within two points and 21-19, and they went for the two-point conversion. Corner Canyon quarterback Hayden Borg completed a pass that appeared destined to level the score with a two-point conversion, but sophomore defensive back Will Overstreet made the tackle at the pylon to prevent the conversion. Unfortunately for the Vikings, the yellow hanky on the field brought a roughing-the-passer call and the Chargers got a second chance from closer in. 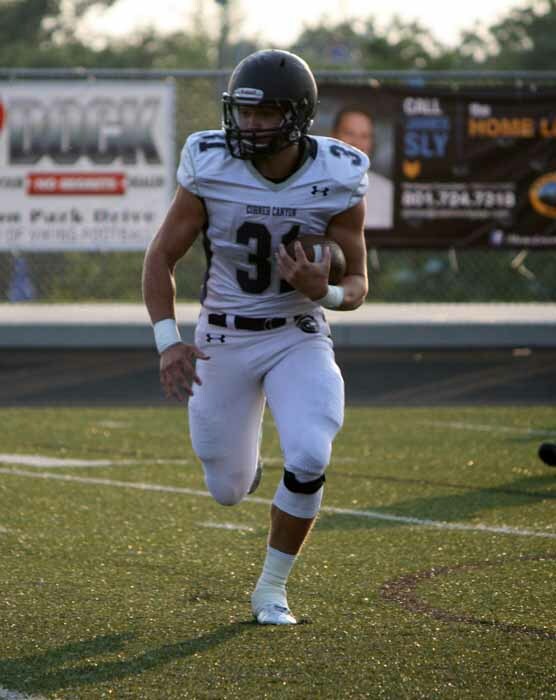 This time, Corner Canyon called running back Tyler Critchfield’s number, but his power run ran into the teeth of the Pleasant Grove defense, and he was turned back. That stand, followed soon after by the Malik Overstreet punt return touchdown, put this one out of reach. Back to those four interceptions…it wasn’t just that. Pleasant Grove quarterback Isaac Hamilton never seemed to get comfortable throwing the football. There’s no way that I, as an outside observer, can draw any definitive conclusions from one game. Overstreet was not the only Viking receiver to find space on the outside Friday night. 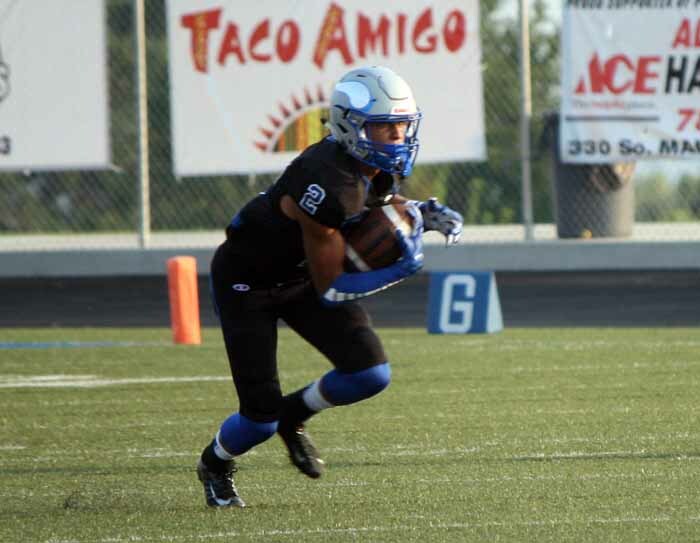 With Koy Wilkinson and Coleman Edwards leading a strong ground game, the speed Pleasant Grove has in its receiver corps gives this team the potential be explosive on offense. In the opener, however, the deep throws always seemed to be a step or two too deep, without enough air under them to let these wideouts run under them. There were timing problems in the passing game most of the night. Opening night jitters? Or something else? If Pleasant Grove solves those issues…this is a very good football team. Injured players are a part of sports, and are especially a part of football. That doesn’t make them any easier to see, or for a team to deal with. Friday night’s game brought bad news on the injury front for a couple of Corner Canyon sesnior captains, and for at least one of the impacted players, the news was particularly bad. Late in the first quarter, 6-1, 220-pound running back Cameron Forte was fighting for yards when a hit broke his femur. Forte had surgery Friday night to have a rod inserted into the leg. Though the senior is making noises about trying to be back for “the playoffs,” the first concern is for his strong recovery from a serious injury. Keaton Bills is a heavily recruited defensive lineman for the Chargers, and on this team, he goes both ways, playing a high percentage of snaps at both offensive tackle and defensive end. It was on offense that Bills went down in the early stages of the fourth quarter, with an apparent ankle injury. He did not return to the field during the game. The Chargers have a lot of talent and are a relatively deep team, as evidenced by a strong performance from Critchfield, a 6-foot, 200-pound runner who took over for Forte, but no team can withstand too many injuries to key players. Hopefully both will heal quickly for their own sake, regardless what happens between the lines. Corner Canyon will look to rebound on the road at Maple Mountain next week, while the Vikings will travel a little further to try to pick up a second straight win to open the 2015 campaign. I moved to Utah from the Sacramento, California area about five years ago. During the five years I covered high school sports in that area, I spent a number of Friday nights in Loomis, California with the Del Oro Golden Eagles, the team Pleasant Grove will visit Friday night. The players have obviously changed, but Del Oro head coach Casey Taylor always has his team ready to play. They are physical and always talented. The Golden Eagles are coming off a 6-6 season, but don’t let that fool you. This was a playoff team a year ago, and they play anyone and everyone. Del Oro plays in the Sacramento area’s deepest Division 1 league (the largest schools) with nationally-ranked Folsom and powerhouse teams like Granite Bay and Oak Ridge (for followers of college football in this state, that is the alma mater of former BYU receiver Austin Collie). To prepare for that murderous league schedule, Taylor takes on all comers. This year, his non-league games includes national powerhouse De La Salle and another San Francisco Bay Area power program, Bellarmine in addition to the matchup with Pleasant Grove. Perhaps the marquee player for Del Oro is Trey Udoffia, a player much like the Vikings’ Malik Overstreet. He plays both ways, is a game-breaking receiver and a special talent in the return game. For those making the trip, enjoy the atmosphere in Loomis. It’s a smaller community in the foothills of the Sierra Nevada mountains, where things pretty much shut down on Friday nights when Del Oro football is in town. Like the community in which Pleasant Grove plays, Loomis is a place that loves high school football.